IMAGINE stepping into a rainforest echoing with a tiger’s ancient roar, the splash of a waterfall, and the whisper of the legendary “people of the forest”. Your temple kingdom awaits in the Asian Forest exhibit where you will encounter Komodo Dragons, Orangutans, and beautiful Sumatran Tigers. 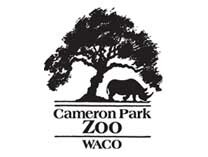 EXPLORE the Flower Garden Banks Reef and follow the Brazos River to where a herd of bison graze and along the way you will experience amazing sights, sounds, and extraordinary animal encounters with otters, black bears, and jaguar. TRAVEL to the African Savannah and observe lions, elephants, white rhinos, and giraffes. Lush landscaping in native vegetation surrounded by splashing waterfalls, a picturesque lake, and ponds, where visitors will see that the wild ones not only survive in their natural habitat, they flourish. Includes all member benefits for two named adults residing at the same address and their children under 18 years of age, plus 5 One-Day Free admission passes. Includes all member benefits for up to two named grandparents residing at the same address and their grandchildren under 18 years of age, plus 5 One-Day Free admission passes. Includes all member benefits for one named individual, plus 2 One-Day Free admission passes. Includes all member benefits for one named senior citizen, plus 2 One-Day Free admission passes. Includes all member benefits for two named senior citizens residing at the same address, plus 2 One-Day Free admission passes.